Hamilton Creek Park is a beautifully designed and landscaped area along the creek where you can go for a walk, have a picnic or just sit and enjoy the scenery and people. It is very attractive with the walkway, the plants, bridges, etc. You will enjoy this peaceful area! It is within walking distance of the downtown square. Burnet is a popular tourist town located 60 miles northwest of Austin, Texas on Highways 29 and 281. 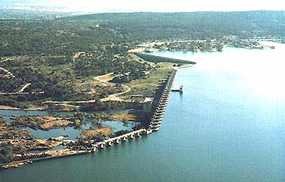 Burnet is 12 miles east of the Buchanan Dam and Lake Buchanan. Burnet is the County Seat of Burnet County in central Texas. 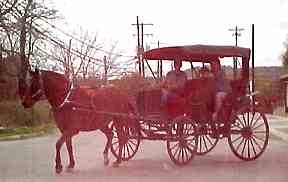 Tour the town in a horse-drawn carriage. The Highland Lakes area of the central Texas Hill Country is a well know area for recreational activities such as golf, boating, fishing, camping and sightseeing. It is also listed in the top three areas of the country as a retirement area. The climate is moderate in the winter and it almost never snows in Burnet. Buchanan Dam photo courtesy of L.C.R.A. Lake Buchanan and Inks Lake are just a 15 minute drive from Burnet on Highway 29 west. There are services available on Lake Buchanan such as cabins for rent, RV parks, etc. It is a very pretty drive on a winding four lane highway through the Texas Hill Country to the lakes. Burnet has a golf course, an athletic center, an airport, a hospital, 2 museums and several tourists attractions. You will find great home cooked meals in the local restaurants and they also have a McDonald's, Sonic Drive-In, What A Burger, Dairy Queen, and a Mr. Gatti's Pizza. In the past few years a new larger H.E.B. and Beall's has opened up in Burnet. The City of Burnet is going through a period of restoration and many antique and gift stores now surround the Courthouse on the Square. Historical homes are also being restored as antique and gift shops and Bed & Breakfast Inns. 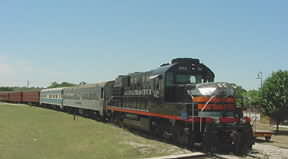 The Hill Country Flyer is a train that makes regular weekend runs from Cedar Park to Burnet to take tourists out to shop at the antique and gift stores in Burnet, to dine in the local resaturants and and to enjoy Hamilton Creek Park. Call 512-477-8468 for more information. To go to the Hill Country Flyer Web Page Click here. Concealed Gun Permit classes and outdoor shooting range 4 miles east of Burnet on Hwy 29. Selling property in the Highland Lakes area and surrounding towns. Offices in Burnet and Kingsland. Lakefront cottage for rent on the Colorado arm of Lake LBJ about 20 minutes west of Burnet. Waterfront location on Lake LBJ, 20 minutes west of Burnet. Nine cabins for rent and 58 RV spaces. Empty Pockets Fishing Guide Service provides excellent fishing trips on beautiful Highland Lakes in Central Texas. Empty Pockets specializes in Striped (Striper) Bass fishing on beautiful Lake Buchanan, Texas. However, Jackie Headrick also provides enjoyable White Bass outings. Striped Bass fishing guide on Lake Buchanan 20 minutes west of Burnet. only 20 minutes west of Burnet. Selling Property in the Highland Lakes Area. Waterfront home on the Colorado Arm of Lake LBJ near Kingsland, Burnet, and Marble Falls. Sleeps up to 8 people. Lake rental cottage and lake vacation house for rent on the Colorado Arm of Lake LBJ. About 20 minutes west of Burnet.